Claire Pentecost’s new site-specific installation titled “the force that through the fossil drives utopia drives my greased age” is a peculiar hybrid: a rectified readymade and a political allegory. As a genre it is nonsensical, but as an individual work of art it is not too bad. As is well known, Marcel Duchamp in 1913 invented the readymade: common objects—a shovel, a urinal, etc.—upon which he bestowed the status of art. The result was both to demystify art and re-fetishize the commodity. Sometimes however, he changed the purchased objects—for example drawing a mustache on a reproduction of the Mona Lisa—and called it a “rectified” readymade. He made quite a few of these, including the “Large Glass,” if you count the encased dust particles as readymades. But he never made anything so purposeful as a political allegory—that would have been antithetical to the anarchy and irreverence of the readymade. Pentecost’s readymade consists of an old motorboat, stern in the air, pitched at a forty-five degree angle. 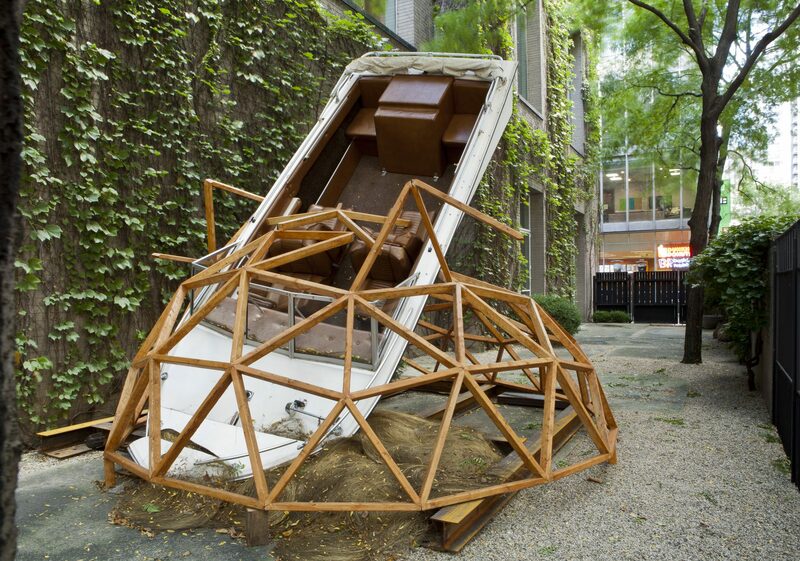 It appears as if it crashed through a geodesic dome made of two-by-fours and landed in a bed of sawgrass. The grass is made of whorls of thin wire.